An attack on a car at the Israeli Embassy in New Delhi injures four people. Fingers have quickly pointed at Iran. An explosion in a car at the Israeli Embassy in New Delhi, which sits near the prime minister’s residence, sent the Indian security establishment scrambling Monday afternoon. 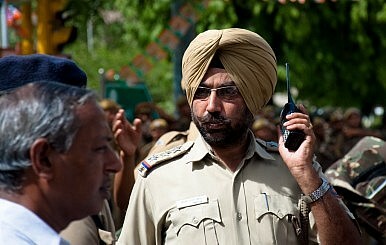 Delhi Police Commissioner B.K. Gupta refrained from saying that terrorists were behind it, although Israel has already called it a terror attack as it coincided with an attempted bombing at its embassy in Georgia the same day. Israeli officials singled out Iran as the likely culprit. Four people, including an Israeli diplomat’s wife, were injured in the incident. Indian External Affairs Minister S.M. Krishna said he has spoken to his Israeli counterpart Avigdor Lieberman and assured him that India will investigate the case thoroughly and keep Tel Aviv informed. Gupta described the explosion as “mild” and pointed out that the brunt of the damage was in the rear, although one person hit in the blast has been undergoing surgery. It appears assailants on motorbikes were behind the attack. Early reports suggest a magnetic device was used to trigger the blast. The Delhi police are said to be treating the incident as a terror attack, until proven otherwise. However, police officials are also not discounting the possibility of a personal motive targeting the Israeli defense attaché, whose wife was among the injured. Delhi Police have put the city on high alert and have stepped up security for major foreign embassies, which are known as key targets for terrorists in the region.